Optical image of the newly synthesized calcium-phosphate glass. A new type of glass based developed by French researchers could offer an alternative to the traditional glasses used for biomedical applications [Soulié et al., Acta Biomaterialia (2016), DOI: 10.1016/j.actbio.2016.05.030]. Bioactive glasses based on silicates are common bone substitutes in orthopaedic and dental applications but it would be an advantage if these glasses could be produced at low temperatures. Now Jérémy Soulié and coworkers from CIRIMAT in Toulouse and ICGM in Montpellier have synthesized glasses based on calcium and phosphate using soft chemistry at low temperatures with water as a solvent. 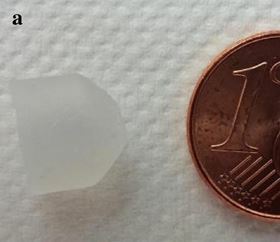 “This is the first time that this type of glass – monolithic calcium pyrophosphate glass – has been reported via this synthesis route, namely at low temperature, with water as a solvent, and using salt precursors,” says Soulié. The new glasses are produced in a three-step process. Firstly, salt precursors are dissolved in water to create a colloidal suspension. The resulting gel is then washed and heated to 70 degrees. Depending on the proportion of Ca ions, which link together the phosphate species, a glassy or glass-ceramic material is formed. When the concentration of Ca is low, the translucent material bears all the hallmarks of glass – the particles (or 'monoliths') have angular shapes, smooth and compact fracture surfaces, and irregular morphologies. According to the researchers, the new calcium-phosphate glasses have a number of innovative features. Ionic salt precursors of the type used here are much less expensive, require no calcination step, and are more biocompatible. Moreover, the entire synthesis process needs temperatures of just 70 degrees – in contrast to the temperatures of around 1000 degrees required to produce traditional phosphate or silicate glasses. “From a biological point of view, these glasses are promising because they are only composed of elements naturally present in the mineral part of bone,” says Soulié. This means that no additional elements – like silicon – have to be eliminated when the glass is resorbed by the body. Furthermore, biochemical reactions occurring after implantation could transform the pyrophosphate species into orthophosphate, which is involved in the formation of apatite analogous to bone minerals. It is still early days for these new glasses because, as Soulié points out, the researchers do not yet even understand their formation mechanism for sure. But however the glasses form, this new family of materials are promising as efficient and tunable bone substitutes. Tech Soft 3D, which makes software development toolkits (SDKs) for 3D printing, has released a new version of its HOOPS Communicator kit.